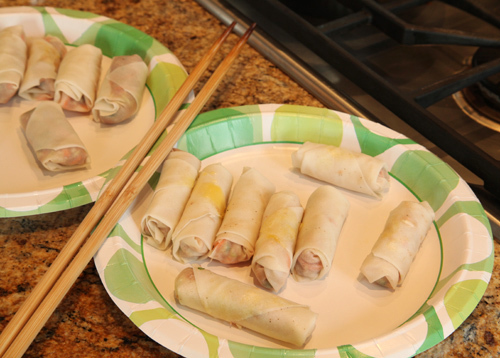 Hanh shared the differences in her American style egg rolls to the ones you would find in her home country, "In Vietnam, they are wrapped in rice paper which is much more labor intensive and hard to handle and they stick to your teeth. They are much larger in Vietnam too- about three times the size and are made with all kinds of fillings including vegetarian. They are also served with noodle and fish sauce as a separate dish. 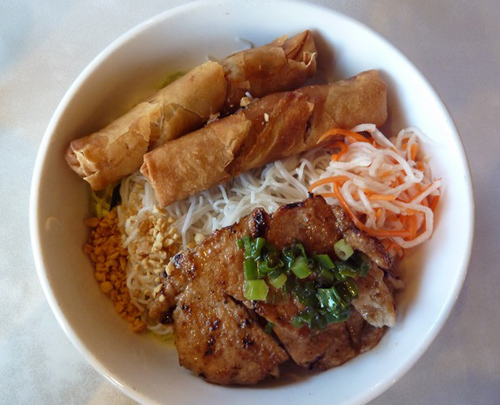 In this dish the egg roll is the 'meat.' 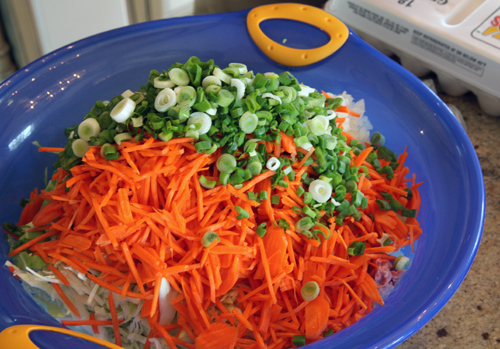 "
The recipe, created after much trial and error by Hanh's sister, Phuong, will produce about 160 egg rolls, (depending how fat you make them). You will have enough to place in your freezer and enjoy for months to come. Ingredients: 1 pound of carrots, shredded; 2 pounds of cabbage, shredded; 2 pounds of ground turkey, chicken or pork; 2 pounds of shrimp (without shells); 2 medium onions, chopped; 1 bunch of spring onion, chopped; 2 eggs; 1 tablespoon plus 1 teaspoon of salt; 6 tablespoons sugar; 2 tablespoons black pepper; 6 tablespoons fish sauce; 1 tablespoon cold water; 5-6 packages of egg roll skin. Place all your ingredients into a bowl and mix well. 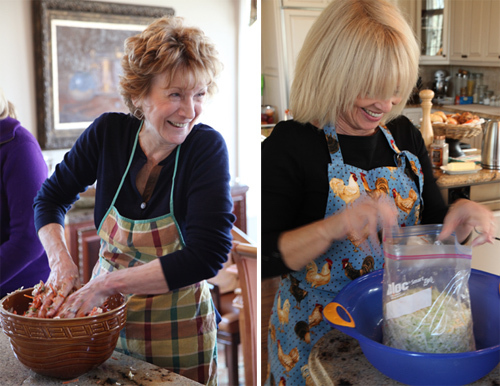 My sweet momma is to the left, her friend Ann to the right. Hanh, "The egg rolls are only as good as the filling. So, follow the recipe until you master it, then you can adjust it to your own taste in terms of spices." To roll your Cha Gio, place a spoonfull of your meat mixture in the middle of your skin. Fold the left and right sides over the meat, then lift the bottom section over. Tuck and roll. 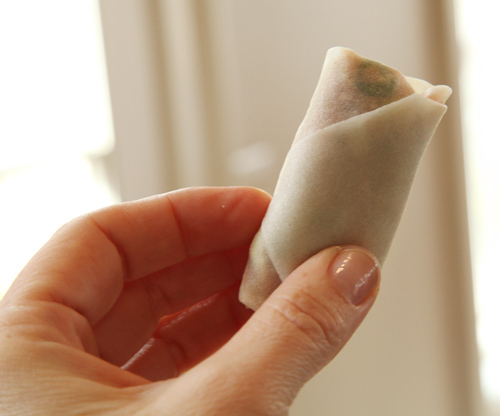 Hanh, "Roll them as tight as you can, seal them well and make sure you cover the filling with the skin at least twice. Err on making them skinny instead of fat." To seal each roll, use a dab of raw egg yolk. I'm allergic to eggs so I used a dab of water and replaced the eggs in the recipe with silken tofu. It worked great...so don't let any allergies stop you from making these, adjust as necessary. They're worth it. There were 13 of us gathered around Hanh's center table, heads down, hands filling and rolling. It took over 2 hours to complete. 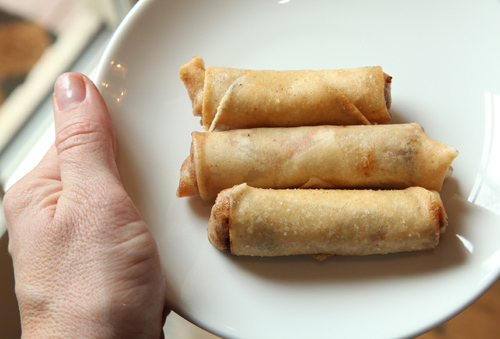 (Hanh quadrupled the recipe so we could all go home with a stash of 50 egg rolls for our freezers) We love Hanh. When you're ready, heat vegetable or canola oil over medium heat. Ensure the oil is very hot (sprinkle water and make sure that it sizzless.) Then, drop in your rolls to cook for 10 minutes and you notice a nicely browned exterior.